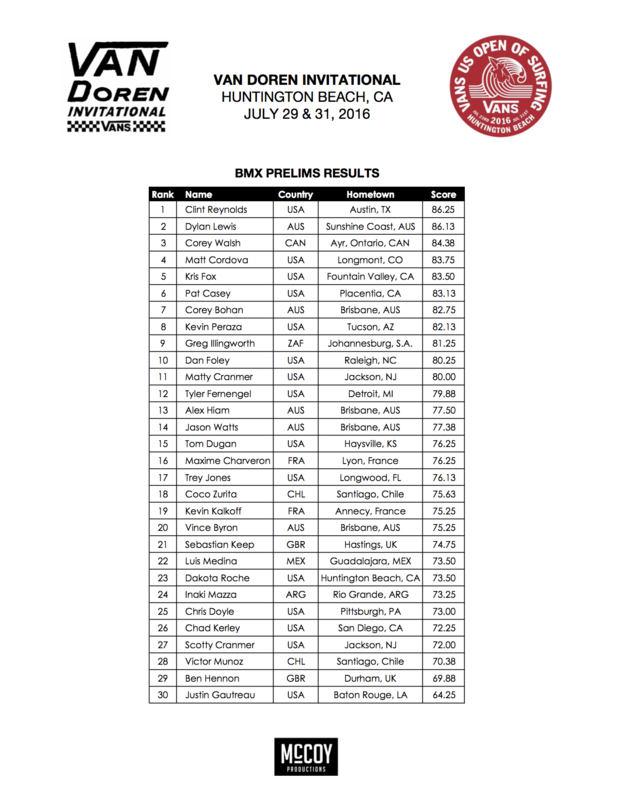 The 2016 Van Doren Invitational BMX Prelims at the Vans US Open of Surfing in Huntington Beach are in the books, with the top 15 riders advancing to Sunday’s final to join the top 5 riders from 2015. Australian Corey Bohan and Californians Kris Fox and Pat Casey will return to the finals in 2016. Corey earned a spot with his classic style and flow, Pat continues to take fakie tricks to the next level, and Kris rode the course ridiculously fast, airing huge and transferring all over the place. SoCal transplant Matt Cordova and Canadian Corey Walsh advanced to the finals with dialed riding of their own. Both aired the hips huge, tweaking variations in the process. Dylan Lewis has already made his visit from Sunshine Coast, Australia a memorable one, by placing 2nd in today’s prelims. He did gigantic hip transfers from the shallow end to the deep end of the bowl, landing with enough speed to do the highest airs of the day. Clint Reynolds did Austin, Texas and New Hampshire proud by taking the top spot in the prelims with 3 solid runs packed with style, flow and unique tricks. A laid over lawnmower-style fufanu and a half-barspin fakie over the spine are tricks you don’t see very often, but look to see him do them again on Sunday during the finals.